Brush up on the most forgettable Marvel film. When the Asgardian God of Thunder returns in Thor: Ragnarok, it’ll be his third solo movie, so you’d do well to remember what happened in the second, The Dark World (2013). Ragnarok might be everything The Dark World isn’t — fun, funny, colorful, memorable — but Thor’s second solo outing still informs his third. The Dark World picks up shortly after the events of the first Avengers with Odin handing Loki a lengthy prison sentence. After Jane Foster gets sucked through a portal to another world from Earth, she encounters the Aether (one of the Infinity Stones!) and gets possesse. Malekith’s Dark Elves pursue her across worlds — including Asgard — people die (and pretend to die) until the Elves are eventually defeated. It’s perhaps the most forgettable MCU film out there, so it’s a good thing we’re here to tell you what to remember. No spoilers for Thor: Ragnarok ahead. This is just a catch-up on *Thor: The Dark World. This one has perhaps less of an impact in Thor: Ragnarok, but you’d do well to remember Taneleer Tivan, aka The Collector (Benicio del Toro). He’s one of the Elders of the Universe, a class of incredibly powerful beings that have existed since shortly after the universe itself was born. The Collector played a role in the first Guardians of the Galaxy but also popped up at the end of The Dark World when Sif and Volstagg give him the Aether for safekeeping. Remembering The Collector could serve you well when you meet The Grandmaster in Thor: Ragnarok. Played by Jeff Goldblum, The Grandmaster is also an Elder of the Universe. Whereas The Collector likes collecting things in his vault, The Grandmaster is obsessed with games and runs gladiatorial Contest of Champions in Thor: Ragnarok that pits Thor against Hulk on the planet Sakaar. Thor’s best buds had larger roles in the first Thor movie, but they also helped Thor, Jane, and Loki escape from Asgard and travel to Svartalfheim to pursue Malekith and ultimately win the day. They’re widely regarded as elite Asgardian warriors who’ve journeyed to multiple worlds to help Thor out, including Jotunheim, Midgard (Earth), and Svartalfheim. While Thor’s been away, the Warriors Three have remained at Asgard and all of them do indeed appear in Thor: Ragnarok. Important reminder: Lady Siff is not part of the Warrior’s Three. 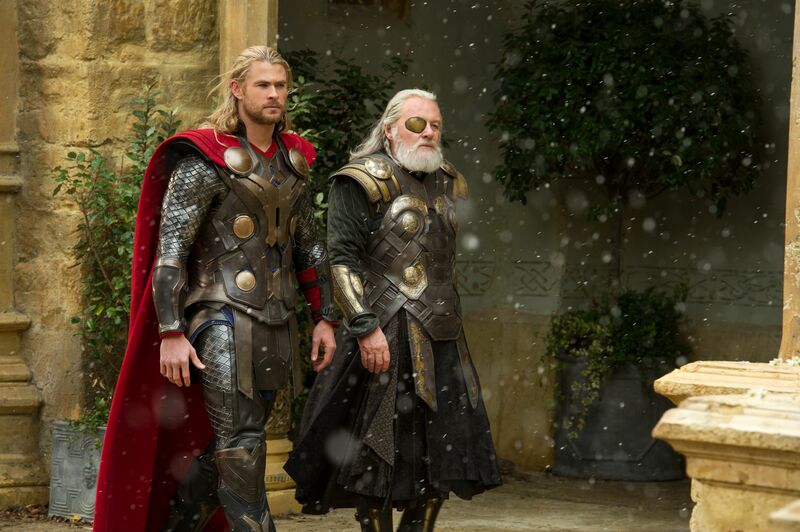 Odin is distraught after Frigga dies. Frigga, Thor’s kind and powerful mother, dies at the hands of Malekith the Dark Elf midway through The Dark World, and there’s no “Friggasleep” to help her heal. After Jane Foster is possessed by the Aether, Thor takes her to Asgard to understand what’s going on. Drawn by the Aether, the Dark Elves attack, which leads to the death of many Asgardians, including Frigga. In a sense, it’s unfortunate that Frigga’s death doesn’t really have any astounding impact on the greater MCU, but it does spur some rage in Odin, who tries to imprison Jane Foster permanently. The king becomes temporary antagonist before the end of the film, but rest assured that without a queen, Asgard will look slightly different in Thor: Ragnarok. Maybe a new queen will come along? Jane and Thor were seemingly reunited for good in 'The Dark World', but that didn't last long. The MCU has a hard time with its female supporting characters, especially Natalie Portman’s Jane Foster, who got sidelined in both Avengers films and by Thor: Ragnarok, the status of their relationship is strained, to say the least. After the final battle of The Dark World is resolved, the God of Thunder returns to Earth to be with Jane. Earlier in the film, however, Foster berated Thor for being MIA for two whole years and the distance between the two continues to be a problem. Thor’s still on Earth by Age of Ultron. Thor praises Jane’s work in astronomy and physics at Tony Stark’s party, so their relationship seems strong, even if Natalie Portman never appears onscreen. Thor leaves Earth, however, missing the events of Captain America: Civil War while he hunts for Infinity Stones and news of Thanos. Loki is revealed as Odin at the end of 'The Dark World'. Loki plays an odd role in The Dark World. Like he does in most MCU films, Loki spends a portion of the movie imprisoned before aiding in Thor’s assault on Malekith. Loki seems to die in an epic battle, “sacrificing” himself to destroy an enemy called Kurse — except he doesn’t actually die. Loki instead assumed the form of an Einherjar Guard and returned to Asgard to usurp the throne from Odin. Using his illusion magic, Loki makes himself look like Odin. Rest assured, we’ll definitely revisit Loki-as-Odin in Thor: Ragnarok back on Asgard while Odin is somewhere else entirely. Thor’s been gone from Asgard for quite some time when things pick up in Ragnarok, so he — and the viewer — might be surprised by what he finds there. Thor: Ragnarok hits theaters November 2, 2017.